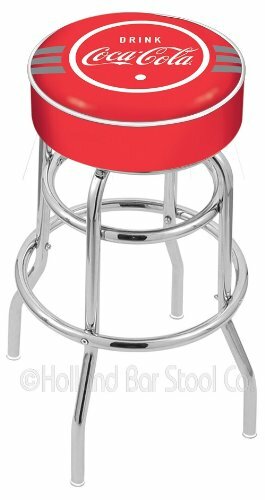 The Coca Cola Silver 30" stool with a 4" cushion and a durable double-ring base and chrome finish. It is a detailed screen print process that applies specially formulated epoxy-vinyl ink in several stages to produce a sharp, crisp, clear image of your nhl team's logo. The structure is triple chrome-plated polished finish that will last for many years. Make your bar or game room come alive with your nhl hockey logo at TeamBarStools.com.